Australia win cements Djokovic’s place amongst tennis greats. – la rambler. The debate on who is considered to be the greatest male tennis player of all time is a topic which is raised frequently among tennis fans, with modern day candidates typically restricted to Roger Federer and Rafael Nadal. But when the career achievements of Novak Djokovic are analysed, there may be a growing number of fans looking to make a case for the Serb – and with good reason. In securing a record-breaking seventh Australian Open title with a straight sets win over Nadal, Djokovic continued his pursuit of the Grand Slam trophy hauls of his two great rivals, and has now overtaken the former record of 14 set by Pete Sampras in 2002. So dominant is Djokovic on the hard court of Melbourne, that Nadal may indeed have had a similar feeling to that which his opponents may experience when standing opposite the Spaniard on court Philippe Chatrier in Paris – as was suggested in commentary before the match. But even the most optimistic of Djokovic fans wouldn’t have expected such a comfortable victory over a player of Nadal’s quality, particularly given the Spaniard’s fine form throughout the competition. In dropping only eight games, it was Djokovic’s most emphatic win in a Grand Slam final, surpassing the 2011 Australian Open Final in which he dropped nine games during a 6-4, 6-2, 6-3 triumph over Andy Murray. 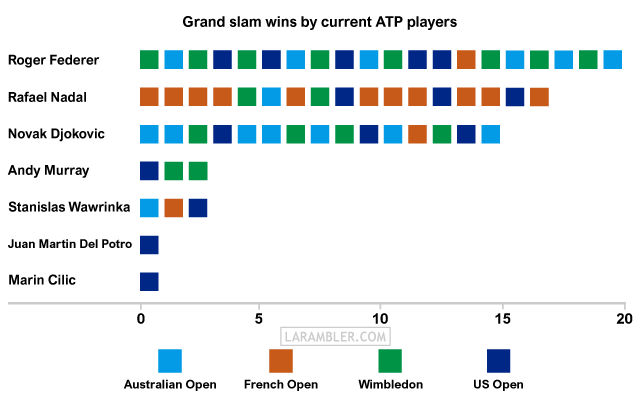 It was also the first time in Nadal’s 25 Grand Slam final appearances that he has failed to win a set. That Nadal hadn’t played a tournament since retiring from his US Open semi final through injury is potentially one reason for the defeat being so convincing. And after performing at a high level during a run to the final which was made to look relatively straightforward, Nadal perhaps missed out on a scare or two, which might have helped prepare him better for a match against his fierce rival. But while the scoreline might have been closer, it’s hard to believe that the ultimate outcome would have differed greatly regardless of what level of additional preparation Nadal may have benefited from – either before or during the tournament. Not since the US Open final of 2013 has Nadal won a match between the two players that has been contested on a hard court, and when Djokovic is playing at the very top of his game, especially on a surface on which he has won 10 of his 15 majors, there’s not much that any player is capable of halting his charge towards silverware. With Nadal holding the record of French Open titles and Roger Federer having lifted the Wimbledon trophy an unmatched eight times, Novak Djokovic now has his own major tournament at which he stands alone as the player with the most titles to his name. The Serb also heads to Roland Garros aiming to achieve, for the second time in his career, the feat of holding all four grand slam trophies at the same time. Fitness permitting, Rafael Nadal will be determined to ensure that doesn’t happen. But regardless of the outcome in Paris, if Djokovic can continue performing at even close to the level he is currently operating at, then Roger Federer will have another rival who can genuinely threaten to match – or surpass – his 20 Grand Slam titles. At which point, debates over the identity of the greatest male tennis player will be even more fiercely argued by the sport’s fans. Previous Post: Transfer market success is key factor in Liverpool and Man United Premier League positions. Next Post: Tense finale ahead for Premier League title contenders.